I’ll continue to post information about upgrades and new features (if there are any) on this blog, but the source will henceforth live on CodePlex. Feel free to leave feedback either here or on the new Silverlight TagCloud project site. Maybe this post should be “Part 3”, but I think of it as more of an incremental increase over Part 2 of this series, so we’ll leave it at 2.1. In any case, this is the third post in a series about a Silverlight TagCloud control I wrote that began with a discussion of the TagCloud’s back-end WCF service and then moved on to the front-end Silverlight control. This post extends the Silverlight control, adding some additional features while easing deployment. We don’t need it anymore as this information is now passed in as initial parameters. This utility dll contains the ColorNames class that I previously discussed. I wanted it here to ease distribution and to use in other Silverlight projects. Also, I’ll likely write a separate post (and release the full source) about the utils dll when it has some real meat in it. Tag item FontFamily can now be set via a property from ASP.NET. The control’s Background can now be set via a property from ASP.NET. Tag item ForegroundColor can now be set via a property from ASP.NET. Tag item MouseOver Foreground color can now be set via a property from ASP.NET. It’s probably best to explain the usage of the new properties and user control with an example. I’ll assume you’ve already installed the TagCloud from my previous post and want to “upgrade”. 1: <%@ Register src="~/User controls/SilverlightTagCloud.ascx" TagName="SilverlightTagCloud"
1: <ucSilverlightTagCloud:SilverlightTagCloud runat="server" TagThreshold="2" FontFamily="Arial"
Also, there was some initialization code in the code-behind. That can all be removed. If any of this is hard to follow, check out the sample project in the code download below. As you can see, the end result of these changes is really focused at being able to customize the appearance of the control via settable properties. Hopefully I’ve got enough features baked in now, though adding additional properties of your own should be pretty easy. I won’t go over the innards of the user control. It’s all the same as what I talked about before (except for the addition of the code to support the above changes), and you can readily check it out in the download. Note that the WCF service code, as before, is in “demo” mode, meaning you can uncomment the BlogEngine.NET specific code if you’re using that platform (and include a reference to BlogEngine.NET), otherwise you’ll need to plug in your own blogging platform’s tag information. Questions, concerns, or requests for missing or new functionality, let me know. This is the second part of a two part series about a Silverlight TagCloud I developed. 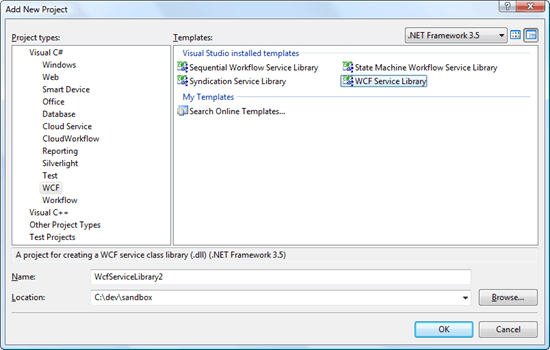 In Part 1 of this series I discussed the WCF service component. This part will be about the Silverlight control itself. The architecture is a simple producer/consumer model. The producer is a WCF service that gathers tag information. The consumer is the Silverlight control, which gets and renders those tags. Assuming you’re on the itscodingtime.com web site and not an RSS reader, you can see the TagCloud in action at the right. Developing this control would have been a piece of cake if not for one thing: resizing. Think about it. The control needs to respond to resize events based on (1) browser resizing and (2) the number of tags being displayed. I was able to make use of a WrapPanel control with a TextBlock for each tag, which greatly simplified some of the work. But the WrapPanel will gladly overflow beyond its container if you let it. Now, you might be able to get away with not worrying about #1 depending on how your web site is laid out, but #2 is a hard one to get around. That’s not to say my solution is the only one or the best. There may well be a 100% width here and a 100% height there method that works (maybe even across all browsers), but I couldn’t figure it out. I did, however, come up with a control that quite nicely resizes based on browser sizing and tag information, so let’s get into the good stuff. First of all, as always, the full source is available for download below. In the .zip, you’ll find projects for the TagCloudService (see Part 1) and TagCloudControl, as well as a basic web app that hosts the service and control and should prove useful in terms of testing. One thing of note: I commented out the BlogEngine.NET specific code in the WCF service and put in a dummy loop to generate tag data. This way you can run the project without having BlogEngine.NET in place. The TagCloud control uses two controls from the Silverlight Toolkit: WrapPanel and TextBlock. You’ll probably want to download the control toolkit if you plan on doing any debugging (though I do include System.Windows.Controls.dll in the .zip download). 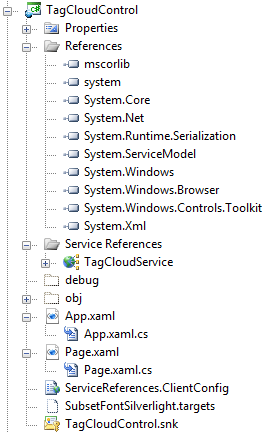 Pretty standard stuff, though note that I’ve already added the service reference to TagCloudService and a strong name key file for the Silverlight control. Let’s get into the control’s files. I defined one style in the Application’s XAML file (per the Future Enhancements list below, I plan to add the ability to specify your own font family as well as tag color, so this style will be going away at some point). baseUrl: This is the base web site url passed in via the hosting site. I have this because I’ve deployed the control to multiple sites, so this is an easy way to have the site identify itself. Note that you could also use Application.Current.Host.Source, then chop off the “ClientBin/Control.xap” part. I might even go that route as a future enhancement and simplification. controlId: This is the Silverlight control’s id from ASP.NET. We need this for sizing. controlHostId: This is the hosting div’s id, also from ASP.NET. We need this for sizing. tagThreshold: In a TagCloud you typically only want to display those tags whose frequency has surpassed a certain threshold. That’s the purpose of this parameter. Set it to 0 if you want to display all tags. minimumFontSize: The minimum font size to use for the “smallest” tag. Tags are sized up proportionally from there. All of those parameters are then handed off to the control’s Page class. Note that I am referencing the Silverlight Control Toolkit here since we are using a WrapPanel. This is where all of the work is done. I won’t go through every part, but instead try to hit the highlights. Turns out I’m using Application.Current.Host.Source anyway. A good cleanup step here might be to just parse out the base url from Application.Current.Host.Source and not use the baseUrl parameter at all. In any case, this initializes our connection to the TagCloud WCF service from which we will be retrieving tag data. However you construct or get the web site’s address, it’s best to dynamically create the WCF endpoint since it alleviates some of the labor when deploying to multiple sites. Of note is the TagThreshold parameter, which the service will use to only return those tags which meet the specified minimum threshold (no point in sending back all tag data if the control isn’t going to make use of it). We loop through the received tags, creating a new TextBlock for each and then wrapping that TextBlock in a HyperlinkButton so that when a user clicks on the tag it takes them to that series of pages. What it’s iterating through is a collection of CloudTag objects, defined as part of the TagCloudService’s data contract. More on that can be found in Part 1 of this series. We passed in the control id’s from ASP.NET to the control, so that’s how we know the clientId and hostId. We then modify their heights and, if not for an initial sizing issue, we’d be done. Unfortunately, I had to throw in an additional kick-start to get the control properly sized when it first loads. Using jQuery’s “ready” function, which is essentially an event handler for when the page is ready for user interaction, we get some width information that is very specific to this blog template. That means you’ll have to tweak this code to do what you need based on your own web site layout. That’s the Silverlight TagCloud control. I’ve already come up with a short list of future enhancements below, so look for an update sometime in the future. Because there’s always room for improvement. 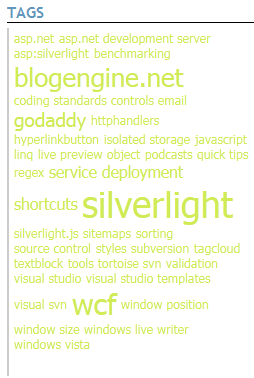 This is the first of two posts about a new Silverlight TagCloud control I wrote. The architecture is simple: On the client-end we’ll have a Silverlight control hosted in an ASP.NET page. On the server-end we’ll have a WCF service that the TagCloud communicates with to get tag item information. Since I knew I wanted to deploy the control/service combination to two different web sites, I opted to create both control and service projects in a new Visual Studio 2008 solution rather than adding them to each of the individual web projects where I’d have duplication of code. Turns out the process of getting the WCF bindings, service config, placement of the Silverlight XAP file, references, etc. all working correctly together when the service and control are not located inside the same solution as the web project was a major chore. Long story short, I figured it all out; I’ll spare you my tales of woe and just give you the solution. In this first post I intend to discuss the WCF service. The next post in the series will cover the Silverlight control. Let me also add that since I use BlogEngine.NET as my hosting platform that the WCF service is tightly-bound with BlogEngine.NET’s Post class. Replacing this underlying post/tag store shouldn’t be that difficult, though, if you want to adapt this to your own blogging platform. No CodeBehind attribute. This is so because I’ll be deploying the compiled service DLL as the service’s implementation, and not releasing the .cs file at all. The service contract defines just one operation: GetTags. It takes as parameters the tag occurrence threshold, which is a minimum number of times a tag must have been used in our blog before we’ll display it in the TagCloud control, and the baseUrl, which is the hosting web site’s base address, as in http://www.itscodingtime.com. We’ll see how the base url is used in a moment. GetTags returns a collection of CloudTag objects. CloudTag is defined with the [DataContract] attribute; it’s members are [DataMember]’s. CloudTag holds relevant information for a single tag on our blog, including the name of the tag, the url to the tag so that visitors can click on a tag in the cloud and be taken to the corresponding posts, and the number of occurrences of the tag. 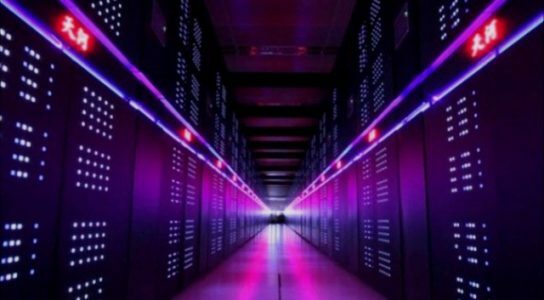 The main part is, of course, the GetTags operation, which utilizes BlogEngine.NET’s Posts collection to retrieve all tags and the number of times each appears across the blog. It then adds only those tags that meet the minimum threshold to the CloudTag collection. This collection is then what is returned to the consuming app, which in this case will be the Silverlight control.